David Ball is a runner. Scratch that. 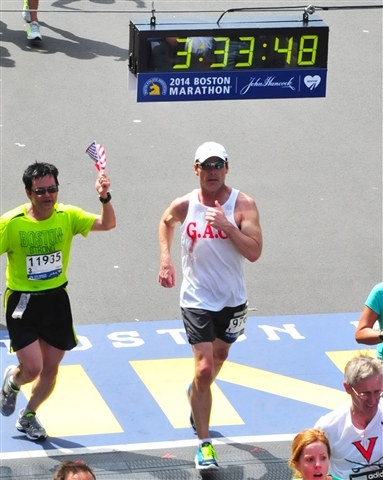 David Ball is a marathoner. To say that running has changed his life would akin to saying the Mona Lisa is a painting of an Italian woman. Being led by the Holy Spirit to the sport of running didn’t just improve his life, it transformed him – mind, body and soul. But as David eagerly shares as often as possible, running is not the source of the transformation. That credit belongs to God and God alone. Running was/is just the tool the Lord used/is using for this particular renovation project. A tool that transformed him from someone just going through the motions into a Christian fully experiencing the gift of life with purpose and promise. It is also a tool that brought him face-to-face with the dark side of life during the 2013 Boston Marathon and the same tool that carried him through to the triumphant splendor of the this year’s race. 16 years ago, I was the most unlikely person to run any distance at all, much less a marathon. As a mid-thirties, tubby-flabby guy, a slow jog to the fridge for food or beer was pretty much the total extent of my exercise regimen. During this stage of life, I’d have to say the whole of my existence, including my faith journey, was just plain average. That is until I broke my leg in three places in a dumb fall at a neighborhood block party. 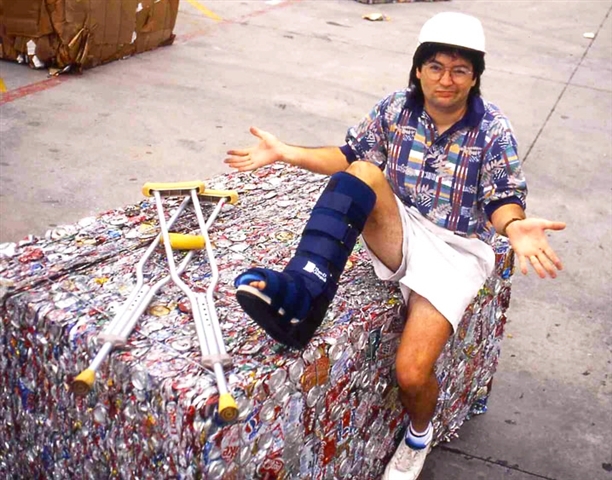 Being that average guy, I ignored the pain and the repeated warnings from my doctor and neglected the therapy prescribed for more than a year. Which, of course, pushed me to the brink of having to live with a shriveled leg, constant pain and a pronounced limp for the rest of my days. Things has taken a turn for the worse indeed. I didn’t recognize myself in photos because of the added weight gain. (My Mom told me I looked as if I’d swallowed a spare tire.) My daily walk to school with the kids had stopped. My marriage was barely existent. My previously average life was now well below average. Out of ideas and excuses, I turned to a God I barely knew and asked Him to do anything He wanted with me because I was done. Letting go and giving myself over to His will actually gave me some relief. God told me to walk, so I did (ouch!). He directed me to this strange place called a “gymnasium” where I worked out for the very first time. He taught me a new word – nutrition. Best of all, my curiosity turned toward what the Bible had to say. After joining a local running club (as a joke), the little Couch-Potato-That-Could started running a mile, then two, then five, then ten. As the miles ramped up, so did my faith. I announced I would train to run a real marathon. My wife jokingly declared me insane. But we laughed through the pain and I persevered. Out of gratitude for this blessing, I decided I would fund raise to help kids who couldn’t run. Three years after breaking my leg, I ran the Austin Marathon and sobbed with joy. The boy who avoided P.E. by joining the band was a marathon runner. God inspired me to keep going, so I ran another marathon, and another. After 9 marathons, I was hungry to BQ (qualifying for Boston at a previous marathon is known as a ‘BQ’ to runners and is cause for high emotion due to the struggle and sacrifice it takes to finally BQ), but was 12 minutes too slow. That’s almost 30 seconds a mile too slow. An experienced hard-nosed Christian runner in my club trained me for more than a year to run faster, and it worked. God was with me every step. I ran Boston 2005, then qualified and ran 2006, then 2008, 2010, 2011 and 2012. Then 2013 changed everything. Crossing the finish line at the Boston Marathon was as huge a thrill as ever, and this year even more since I’d run my fastest Boston time. Everything had come together to run 3 hours 23 minutes. The crowds were extremely loud; especially in that last special one-third of a mile where you pass by thousands of cheering fans on Boylston Street and large filled grandstands with the two-story finish line structure beckoning you to victory. As soon as I finished, I walked directly to the church steeple just a few yards past the finish line to pray a tearful prayer of thanksgiving. About 15 minutes later, as I joined the river of finishers shoulder to shoulder; basking in runners’ glory a city block away from the finish line, a sharp loud blast vaulted everyone forward; a plume of white smoke and tiny bits of debris shot up into the perfect blue sky. The ringing in our ears and collective confusion had us standing in sudden silence when the second blast went off farther up Boylston Street. The actual finish line structure obscured my view of the carnage, but the impact of the blasts left no doubt that people were killed or gravely injured by the bombs. Terrorists had bombed the Twin Tower equivalent in sports. My beloved country was again under attack on our own soil. Over the following days, as the terrorists and their motives were identified, I resolved that I would return in 2014 and fight to restore American strength and security with God’s help. I was far from the only one. Runners from all over this land clamored to qualify for Boston so they could join the biggest comeback rally in modern sports. Race officials allowed the ranks to swell to nearly 36,000 runners (9,000 more than usual). 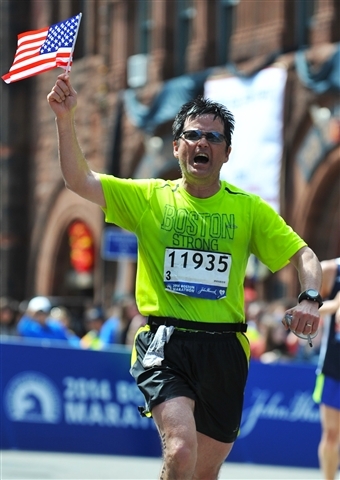 The rally cry of “Boston Strong” was prevalent throughout the entire 26.2 mile course on shirts, signs and banners. The National Anthem was sung beautifully; the 4-Huey helicopter flyover was stunning and loud. But the greatest statement was the raw numbers of running fans who dared against terrorism and thronged to the course to support us as we ran. Nothing I can think of quite describes the energy shown by the fans. I felt carried along by the sheer power of the cheering. Though the day was considerably hotter than 2013, nobody was concerned about their finish times. 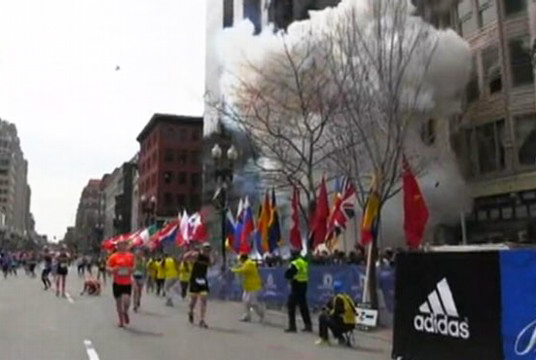 They just wanted to BE Boston Strong! At Mile 25, I pulled out a small 10-inch American flag and held it high the last 1.2 miles. As I past the sites of both bomb blasts and inspired by the cheering crowds, all my emotion came out and I screamed “Boston Strong! America Strong!” In unison the crowd shouted back with tears rolling down their faces, “USA! USA! USA! USA!” over and over again. It was an amazing and unforgettable moment in time. I crossed the finish line, and purposely made my way to that church steeple once more. Bowed my head; prayed a prayer of thanksgiving to God for his strength, guidance and blessing. A year of work in training, sacrifice, and running was instantly worth it all. I made my way to the crowds on the sidelines who thanked all the runners for running. I high-fived many of them with their Boston Strong shirts saying thanks for being Boston Strong! America Strong! And all of this was because as I waddled through one of the deepest valleys of my life 16 years prior, I gave it all to God. If He can bless and transform my life in such fantastic and (at the time) unfathomable ways, imagine what God can and will do for you. *David Ball is a member of First United Methodist Church of Hurst. **Vance Morton is the director of Communications & IT for the CTC. vance@ctcumc.org. If you have a life transformation story that you’d like to share, please send it to Vance at the email address above.